JOHN LOCKE SCRIPPS. 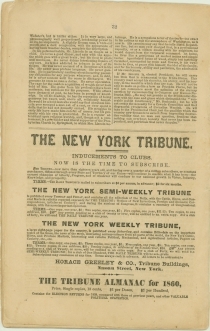 Pamphlet, “Tribune Tracts –No. 6. 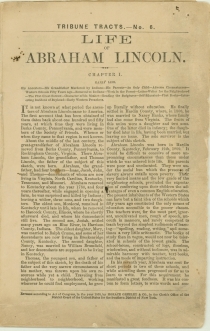 Life of Abraham Lincoln. Chapter 1. Early Life.” New York: Tribune, 1860. 32 pp. 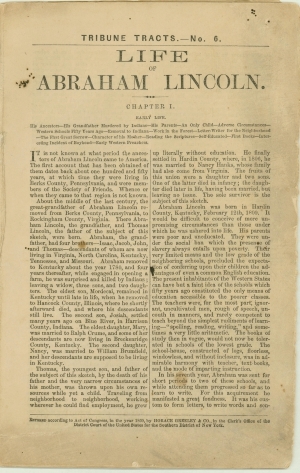 Original stitching intact, ads for The New York Tribune and the Tribune Almanac of 1860 on back cover, light age, small tear at bottom right not affecting text, minor chipping, otherwise good. 6 x 9¼ in.